If it’s your first time buying a home or block of land, you’ll be pleased to hear that the process can be quite straightforward. Here, we cover the six major steps of purchasing land for sale in Mackay for a smooth journey to settlement. Before you start planning your dream home design, it’s a wise idea to research suburbs first to decide where you’ll want to live and invest. You may want to be sure that there are transport options, schools and other specific services in the area, as well as a good level of capital growth for your investment. You might begin this search with a detailed suburb profile from a website such as CoreLogic’s Residex, which offers two free reports per month. Using real estate data that covers prices, sales and growth can help you to narrow down your options of land for sale in Mackay. The next step is to visit your bank or mortgage broker, who should work for you to get the best deal on your finance and arrange pre-approval. How will you know you’re ready to buy? Some first home buyers will aim to save at least 20% for their deposit to avoid paying Lenders Mortgage Insurance, however you’ll likely be able to purchase land with a lower deposit. Whatever amount you plan to borrow, it’s important that you feel confident you’ll be able to make the repayments on the final price of your house and land. Once you have identified the ideal neighbourhoods for your home and have finance pre-approved, it’s time to look at lots of land. Consider the size and width of a lot, the orientation, the proximity of neighbours, any elevations that may affect the house design and of course, the price. Lots from 600 up to 1,000 square metres will provide the opportunity for extra backyard space and landscaping. If you’re searching in Plantation Palms we also offer a range of house and land for sale in Mackay, so you can be confident the home design will fit on and suit the individual lot. If you’ve found the perfect place and are ready to buy your lot or house and land, let our sales team know and Plantation Palms will prepare your contract. You’ll need to provide full names, addresses and contact details of all purchasers, as well as your solicitor details. This contract will then be sent to your solicitor, who will go over the details before you sign and provide a refundable $500 deposit. You’ll be provided with a copy of this signed contract to take to your finance broker or bank so they can organise your finance. If you’re borrowing money to build, you’ll also sign a contract with your builder at this stage. Settlement will occur 14 days from the date that your finance is approved, or if the land is off the plan it will occur 14 days from the issue of titles. Congratulations! You are now a property owner. If you have purchased a house and land package, then work will soon begin on your home. 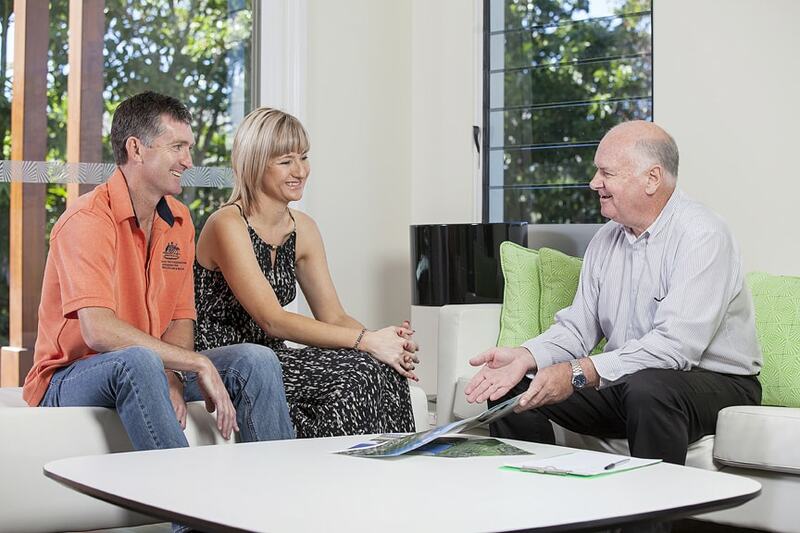 If you have purchased land only, the next step is to get in touch with your builder of choice. Your Plantation Palms team will be happy to help you navigate through the entire land buying process.